Countless websites have sprung up that allow users to upload their photos and other artwork to a website where they may be viewed by visitors from around the world. Some of these sites, including Wikimedia Commons (a media repository for Wikipedia and its sister projects) and Flickr (a popular photo sharing site), allow users to license their uploads under one of several free licenses; others, such as Facebook (surprisingly or not, one of the most popular websites for photo sharing in the United States), have taken a dimmer approach to free licensing. Photos are no different from texts in that they have an automatic copyright; however, I think they’re also different in that very good photographs can often be sold for a price (unlike, say, a contribution to a blog or an article on Wikipedia). This means that photographers are sometimes reluctant to give away rights to their photos as easily as their text contributions. Despite this, however, there are a huge number of images on Flickr and the Wikimedia Commons that are licensed under lenient free licenses. In the case of the Wikimedia Commons, a free license is required — all media that are not licensed under the Creative Commons, GFDL, or a similar free license are deleted. Still, it’s amazing that so many people have licensed their photos and other artistic creations under free licenses that may even allow others sell their work for profit. Part of the reason, I think, is the relative ease-of-use of the licenses, as I mentioned in a prior post. But some of it is thanks to these websites, who have made it incredibly easy for users to license their contributions under a free license. Users uploading images to the Wikimedia Commons are presented with a selection box that allows them to select a license of their choice; on Flickr, while the default license is “All rights reserved” (i.e., no free license at all), it is a matter of a few clicks to go into the preferences screen and change the default license for all past and/or future uploads. Compared to the relative “automaticness” of Wikipedia’s GFDL licensing, both of these websites make the user explicitly choose to license their media under a free license. Even then, freely licensed media are available in abundance — all this can only mean that the free licensing movement has caught on among the regular Internet crowd, even among those who would not have been interested in licenses before. All of this is not without its downsides, though. There will always be companies that take such freely licensed media from the Internet (much of which is of sufficient quality to be used in professional settings) and use it for their own profit. While this is explicitly allowed under the free licenses that many of these media are licensed under, it has and will most definitely continue to generate controversy when it happens. One particular example is of Virgin Mobile and Flickr. In 2007, Virgin Mobile used several freely licensed (specifically, CC-BY licensed) images from Flickr in their advertising campaign. Virgin duly attributed the images, printing in fine text the URLs of the Flickr profiles of the original photographers. So far, so good. The problem was with one of their posters that used a freely licensed image with a picture of a girl, Alison Chang, in it. The problem ultimately was that although Flickr had every right to use the photo itself in their advertising campaign (as they had attributed it), they did not have the right to use Chang’s likeness in their campaign without a model release. Even worse, the poster’s tagline, “Dump Your Pen Friend,” is clearly derogatory and insulting to Chang. In the end, Chang and the photographer sued Virgin Mobile, and surprisingly, the Creative Commons organization because “as the creator of [the CC-BY license], they have an obligation to define it succinctly.” It will be interesting to see what happens with this lawsuit. While it seems that Virgin Mobile appears to have committed some privacy violations (wholly unrelated to copyright), the plight of Creative Commons seems to be less easy to predict. 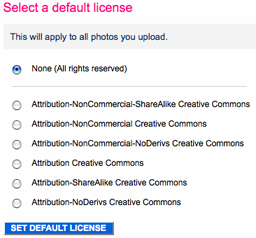 I would guess that Creative Commons has no obligation to specify each and everything that licensees may do with CC-licensed content. Considering that CC is a free license that deals with copyright issues, those using the licenses should consider other issues, such as privacy and using the likeness of people, in parallel with copyright. Creative Commons should not be held liable for organizations and other entities that fail to do their due diligence in this regard. Today, stories of high school students pasting in content from Wikipedia into their own essays and research projects abound. Some educators have thrown their hands up in the air, baffled by this whole “Internet” thing. Others have clamped down, forbidding the use of Wikipedia in the classroom and calling it an irrelevant information source. While this plagiarism from Wikipedia may seem like child’s play, serious legal issues also play a part. As I’ve covered in this blog, Wikipedia content is not released into the public domain — by default, all content is licensed under the GNU Free Documentation License, and the copyright remains under the ownership of each contributor. What complicated this matter was that the user who contributed a large portion of the text, Ydorb, had licensed his contributions into the public domain. Therefore, it would seem that this act of “plagiarism” was, in fact, lawful (albeit troubling coming from an experienced reporter). However, the nature of Wikipedia’s collaborative and cumulative editing meant that portions that had been contributed by other users, who unlike Ydorb had not released their contributions to the public domain, were still under their copyright. This is an issue present in all wikis — because content is not simply written by one user and left at that, the ownership of specific bits of text, rather than entire articles, becomes important. While it may be easy for people (even reporters) to become complacent about Wikipedia copyright, the bottom line is that every contribution to Wikipedia is still covered by the same copyright that automatically covers any other creative work. A free license is not a license to do whatever you want; there are certain bounds, and users need to be educated about this.